It’s the most wonderful time of the year… THANKSGIVING! Because of the food of course! The annual fanfare over Thanksgiving food far surpasses that of any of the other American holidays. 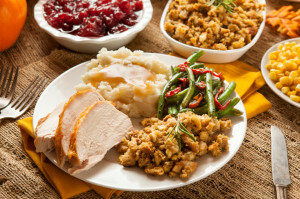 Thanksgiving is when umami junkies like all of us at MSGdish get our fill! I can already just imagine that first bite of four cheese macaroni and cheese with the extra aged parmesan—we wait all year for moments like this. When all is said and done, when bellies are full and the teams we’ve been watching all day have hung up their helmets, you take a power nap and then wake up for an extravagant shopping trip and come home to gobs of Thanksgiving leftovers that— if you’re in my family—HAS to be consumed. Thanksgiving happens every year, but I don’t tire of the magic—that is, until about day three of leftovers. Seriously, how many turkey sandwiches can I really eat? But, in my family, waste is not permissible, so over the years, I’ve had to figure out how to bring excitement back to three-day-old turkey, cranberry sauce that is definitely starting to separate, and stuffing that is getting mushy by the minute. Here are my tips and tricks to remix Thanksgiving leftovers! 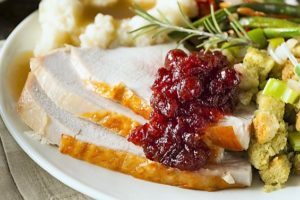 Extra cranberry sauce – when there is a ton of cranberry sauce leftover, I like to make cranberry sauce and peanut butter sandwiches. This is best done with a thicker sauce, but if you have a thinner sauce, then use thicker bread. It’s so delicious and makes for an excellent mid-day snack, or pack one for that Black Friday shopping trip. Too much stuffing – There are a couple things I like to do with stuffing, to eat it as is after a couple days, I like to throw some in a small frying pan with about a tablespoon of olive oil and let it get all toasty again. 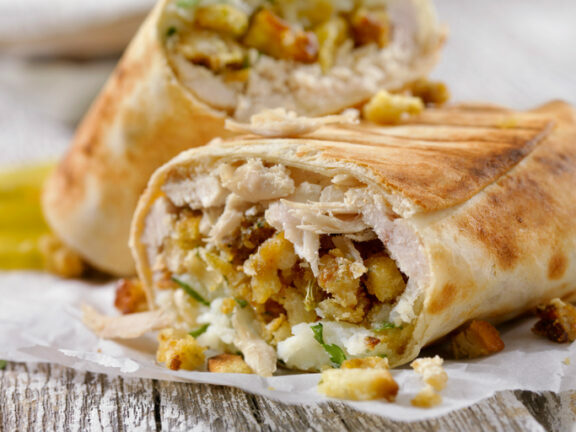 An alternative way to eat stuffing after Thanksgiving is to wrap stuffing in a burrito with leftover meats and roasted veggies. My final trick is to put stuffing in scrambled eggs. Sprinkle a little MSG and a little salt to increase umami flavor and then scramble as usual. You’ll get a fluffy, bready, savory breakfast out of it! Turkey meat– see burrito suggestion above. But also use the meat to make a whole new dish. Lots of recipes call for rotisserie chicken, just use your turkey instead to make soup, fried rice, salad, pizza, pot pie and more! Gravy boats – Gravy is absolutely delicious on most things, if you freeze it in little containers, you can use most versions of gravy as a condiment right on through December. Mac and cheese overload – Mac and cheese is like the best thing on earth. Unfortunately, the cheese congeals by the next day, super frustrating when you’re yearning for that cheesy goodness. So try making fried mac and cheese balls or sticks. There are so many recipes to choose from online. Here’s an easy one from Damn Delicious. If you have any other fun ideas, please share by commenting below. And, of course, follow USDA’s turkey tips and always follow the Clean, Separate, Cook and Chill food handling practices recommended by the Partnership for Food Safety Education. To test your knowledge take this Thanksgiving Food Safety Quiz. As the holiday season kicks off, beginning with the celebration of Thanksgiving, millions of Americans join together with family and friends in homes and restaurants all over the country. 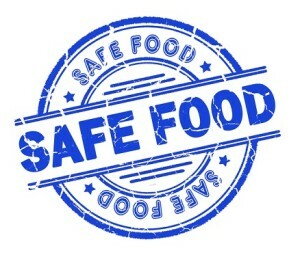 And we can be thankful not just for our food – but also to know that everything on our table is safe to eat. Think about some of the senses that are associated with favorite holiday foods: The smell of cinnamon and homemade pumpkin pie baking in the oven. Freshly baked yeast rolls teasing our senses. The savory aroma of honey-glazed ham or a roasted turkey, wafting through the house.